Conley Equipment Company offers a wide variety of power-related services and power products. We serve the entire country with top experts in cost-effective power systems solutions and services. That’s why we’ve formed a strategic partnership with the largest single-site battery manufacturer in the world: East Penn Manufacturing. East Penn Manufacturing is a family-owned enterprise that values their employees and the contributions they make. This is a critical factor when it comes to ensuring products that are made to the highest quality standards and fostering an environment of innovation and progress. Quality employees produce quality batteries. It’s as simple as that. It’s their quality products that allow us to sell their telecommunication battery solutions with no hesitation. We want our customers to receive the best, and East Penn is all too eager to supply it. When you want a battery product that is reliable, well-designed, and powerful, turn to East Penn. Exclusive IPF ® technology optimizes power capacity, cell consistency, and long-term reliability. Front access design for easy installation and maintenance. Space saving Absorbed Glass Mat (AGM) construction (48 volt system fits in 23″ racks). Reinforced case resists bulging and meets safety requirements (UL94 V-0). Computer-aided design and manufacturing control processes and standards to ensure quality products. Battery design and construction meet UL recognition requirements. East Penn’s Deka Unigy I battery line offers unmatched performance and longevity. They are also designed to keep your systems functioning safely. Advanced GEM technology allows their batteries to cut down on corrosive acid fumes and spills. At Conley Equipment Company we’ve provided our customers with high-quality telecommunication battery products at affordable prices for over 35 years. 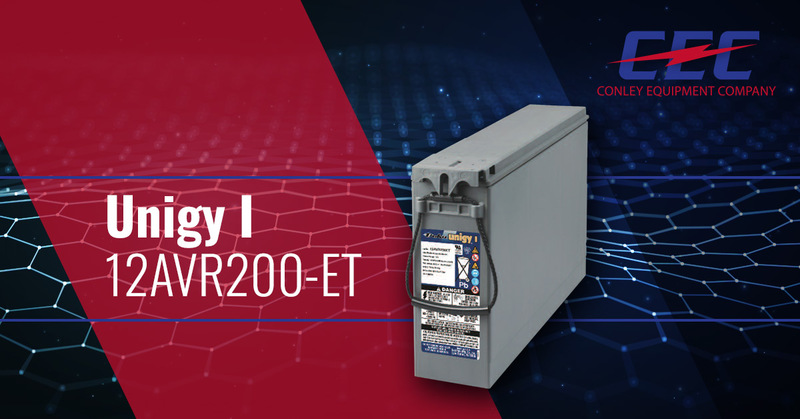 If you’re ready to move forward and get your free quote on a Unigy I – 12AVR200 – ET battery, please fill out a contact form to the right. Since we prioritize service, we won’t make you wait. One of our battery experts will get back to you as soon as we possibly can. If you’re looking for even more benefits and specifications regarding your Unigy I – 12AVR200-ET battery, you can read an official product cut sheet here for some additional information.